‘I’m just popping to the supermarket to buy some milk and bread,” I tell my husband, and some time later I emerge laden with two bags full of groceries. Sound familiar? Well, you may be pleased to know that you are not alone, and it’s not really your fault. Supermarkets aim to get consumers to spend money, and they invest time and money finding out ways to get you to buy things you do not want or need. So how do we deal with the challenges of the supermarket, and how do we stick to a budget while we are in there? According to statistics, an average family will spend 20 to 25 percent of its income on grocery shopping. In the current financial climate, many people are trying to cut back and save money. Is it possible to cut back on groceries? Is one really able to save money on food? The good news is YES, you can save on your shopping bill. By understanding supermarket psychology, you can learn to avoid the pitfalls that are waiting for you. In addition, we have some helpful hints about sticking to your budget in the supermarket. Supermarket psychology is a marketing tactic employed by stores to get consumers to spend more than they intended. Once you are in the supermarket, there are many tricks to get you to stay there; it is proven that the longer you stay in the supermarket the more money you are likely to spend. That is why milk, eggs and bread are located at different ends of the supermarket and usually at the back: even if you are just popping in for bread, you will have to walk through the whole supermarket just to reach them. From the moment you walk through the supermarket’s doors you are accosted by different devices to entice you to buy things. Nothing is left to chance, from the positioning of the fruit and vegetables near the door (they look better in natural light), to the wonderful smell of freshly baked bread, everything is carefully thought out. So how do supermarkets know what we want and what will attract us? Some of this information is provided by marketing consultants, and some of the data is drawn from details of what we buy. When you have membership cards, supermarkets can record your data and use it to see what attracts you. Special offers for those with membership cards are based on what customers with membership cards want to buy. But the good news is that once you are aware of these tactics, you can be on your guard and avoid temptation. Irrational pricing: This means pricing an item at 2.99 instead of 3. Your brain will remember the first digit, 2, unless you make the conscious effort to notice that the price is really 3. Aisle order: The most commonly bought items are in the middle of the aisle. This means that you have to walk the maximum distance (past the largest number of products) to get to your item of choice. Eye-level:Most expensive items are at eye-level. Check on higher and lower shelves to find the store’s own brands and better deals. Point of sale: The products that are at the checkout counters are designed to attract us. While waiting to check your items out it is tempting to browse a magazine, or have some gum or a chocolate bar. This also appeals to children – how many times have you bought a candy bar because your child or grandchild couldn’t resist the appeal of them while waiting in line. The ends of aisles may also have “special” offers. Special offers: One plus one, three for two, etc. We all love to feel that we are getting a bargain, and these offers are very tempting. But think carefully before you buy them. In some cases the three for two of a brand name does not work out cheaper than buying a store brand. You must think carefully whether these products are really something you need and will use, or if you are being attracted by the deal. Deals that are three for X shekels often save you very little money and encourage you to spend it all now. Do you really need three jars of peanut butter? However, if it is a product you use on a regular basis, then take advantage of the saving. Rearrangement: How many times have you looked in the usual place for your cereal and found it has moved. Shops rearrange products on a semi-regular basis to expose customers to different products. There is no such thing as a free lunch: there is a reason why tasters are given out. This is proven to increase the amount you spend by 15 percent; if you want to taste the product, go ahead but be aware of the psychological effects it has on your shopping. Navigating the isles: So, now that we know the tricks that the supermarket has in store for us, how do we deal with it, and how can we cut back on our grocery bill? The key to successfully navigating the supermarket is to be prepared. The first stage of preparation begins well before you get to the supermarket, by planning your weekly menus in advance. When you have a menu for the week, check the items in your pantry, fridge and freezer and see what you already have. Then you can accurately assess what shopping you really need for the next week. If you find that you are well-stocked with certain food items, you might want to change your menu and plan to use them up. It is estimated that up to 30 percent of all food bought is wasted! For many families, a large portion of their overdraft comes from their kitchen, so it is a good idea to try and use up the food you have: stick to buying the essentials. Another benefit of making an accurate shopping list is that it will prevent unnecessary extra trips to the corner grocery store or supermarket. If you manage to buy everything you need in one trip, you will save yourself time and money. This principle is even more important at times of increased spending such asPessah and Succot. Plan your menus in advance, and make an accurate shopping list. Once you have it written the shopping list you are all ready to shop, right? Well, there are two additional factors worth bearing in mind. Firstly, don’t shop on an empty stomach. Everything looks so much more appealing when you are hungry, and you are more likely to impulse buy. The smell of freshly baked bread (which by the way is actually pumped into the supermarket) can be overwhelming when you have an empty stomach, so don’t shop when you are hungry. Secondly, don’t shop with young kids. Shopping with young children or grandchildren could increase your bill by up to 25%. However, it is important to take older children shopping to teach them how to shop on a budget. Most people have a supermarket they like to go to; maybe it’s located close to your house, maybe it is laid out nicely. But it is worth spending some time comparing the prices at different supermarkets. No one wants to compare the prices of every item they buy. But if you choose 10 large items (not the basic products, since there are government restrictions on the prices) that you regularly buy, you may be surprised to see that things are cheaper in a different supermarket. Consider going to a large discount supermarket once a month to stock up on store-brand essentials, and then buy perishables from your local supermarket once a week. 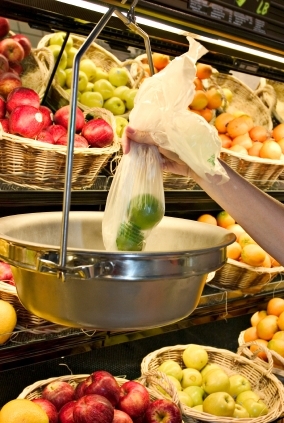 In general, buying from a large supermarket rather than a small one can save you 20 to 30 percent on your shopping bill! When you are in the supermarket, it is important to try and stick to your list. In an average supermarket there are 15,000 products and it is important not to be overwhelmed. Do not be taken in by the advertising and “special deals” on things you don’t need. Many people will be reminded of things that they need when they are in the supermarket, and you may find yourself adding to your list. But if you are trying to keep to a budget, try to differentiate between what you need and what you want, and only buy those things that you need. Up to 25 percent of the items in your cart are things you want but don’t necessarily need and can do without for the week. You may find that you need less of these items as you get used to planning meals in advance and cooking according to your menu. Brand names are invariably more expensive than the supermarket’s own brand, but on many products there is little difference. Try buying store brands and see if you can tell the difference. In addition, buying larger sizes can work out much cheaper. I recently noticed a 200-gram jar of coffee was only 2 NIS more expensive than a 100-gram jar! Supermarkets often have the price per 100 grams listed and it is worth comparing this price. If there are deals on items you use regularly, check to see if it is really worth it, or if you can get a better price by buying a store brand or cheaper brand. In general, one plus one is a good deal, but the “specials” are best avoided. Finally, when it comes to paying for your shopping, remember to be on guard! Standing waiting to check out your groceries is annoying, but resist temptation and don’t buy the chocolate/nuts/gum. Some shops have deals at the checkout counter, but only take advantage if it was on your list and you need it. When it comes to paying, do not pay in installments. Week after week I am surprised by the number of people who choose to pay for the week’s shopping for the next three, six, or even 10 months! It does not make your shopping any cheaper, it just means you will still be paying for this week’s shopping for a long time! While this may all sound rather overwhelming, it is possible to reduce your supermarket spending. Not only will you save yourself money, you will be helping the environment by reducing the amount of waste. You also will enjoy the feeling of control that comes with sticking to your goals and will notice the benefits of planning your shopping and sticking to your plan. This is an important step in taking control of your household finances, which can be liberating. Now that we have explained some of the Supermarket Psychology tactics the stores use – will YOU shop differently?